Rescue League/Shelter of the Month! 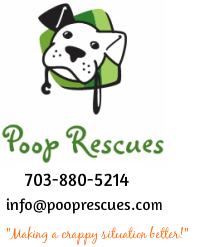 Why should I use Poop Rescues? Dog waste is unsightly, and smelly, yet it’s an unavoidable part of dog ownership. It can carry disease and it’s a nuisance to you, your family, and your neighbors. Poop Rescues ensures your yard is healthy and free of accumulated dog waste year round. Plus 10% of all profits are going to animals in need. We visit your home on a pre-scheduled day. We scoop your yard, double bag the waste, and remove it from your property disposing it according to county and state regulations. We’ll notify you if we see anything abnormal in your dog’s stool that may be cause for concern (for example, worms, foreign objects, or loose stool). No contract is necessary. Service can be canceled at anytime by giving us a call prior to your service day. Can my dog be in the yard while you’re scooping? Yes. We enjoy interacting with dogs; however, there are cases when a dog will not let our worker perform services. If you know that your dog is not good with strangers, or it becomes apparent that your dog will not allow us to service your property, then we ask that you restrain or confine the dog while we service your property. We don’t want to take unnecessary risks with your dog or our employees. Can I schedule service for a certain day? Our service days are based on location; however, if you have a special event and your yard needs to be in tip-top shape, we can arrange for a regular service day to be changed for that event. Do I need to leave my gate unlocked for scooper service? Yes, we will NOT attempt to enter your yard without the gate being unlocked. A $5 fee is applied for scheduled service if we cannot enter and you’ve forgotten to call us and let us know. You will not be charged if you contact our office in sufficient time before your scheduled service. There will also be no charge for service missed due to weather or some other event beyond your control. Is there an extra charge for the first time? There may be a start charge for the first service if there is an excessive accumulation of waste. This charge ranges from $35 for the first hour and ½ and $15 per additional ½ hour. Yes! One-time-only or short-term service is also available. Payment is due at the time of service. To start your Poop Rescues Pet Waste Removal Service, simply call us at 703-880-5214, or click here to sign up. If you have any questions, feel free to e-mail info@pooprescues.com. Does anyone need to be home when you come to scoop? Presently, we service most of Northern Virginia. If you are not sure if we service your area, feel free to give us a call at 703-880-5214 or e-mail info@pooprescues.com. Yes we do. We will give you one regular service day free for each new customer you refer. Not available for one time service customers.